Diane Keaton, Robert DeNiro, Robert Duvall, Francis Ford Coppola, James Caan, Al Pacino and Talia Shire pose for a portrait at the 45th Anniversary screening of "The Godfather" during the Tribeca Film Festival at Radio City Music Hall on April 29, 2017 in New York City. Debilitating studio battles. One miraculously still cat. Mooning contests between James Caan and Marlon Brando. These were the memories shared, 45 years later, on the making of "The Godfather" in a rare reunion of the film's cast and director Francis Ford Coppola at Radio City Music Hall. 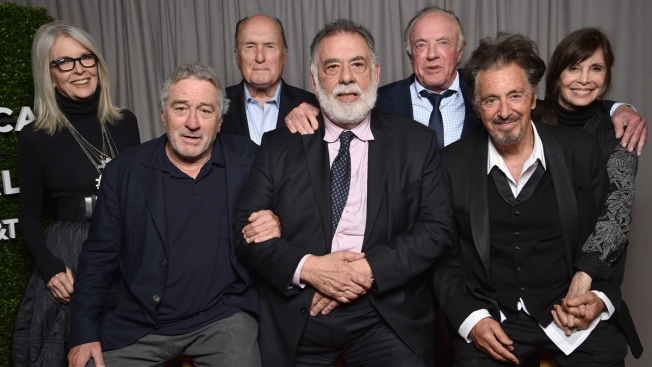 With the stage decorated to resemble the library of Brando's Don Corleone, and a portrait of the actor hanging above, Coppola and cast members Al Pacino, Robert De Niro, Robert Duvall, James Caan, Diane Keaton and Talia Shire, gathered together once again on Saturday. The night was organized by De Niro as the closing evening of his Tribeca Film Festival, which preceded the affair with a grand double feature of "The Godfather," parts one and two. That made for a long day — the event spanned nearly nine hours — but one of giddy delight for devotees of Coppola's masterpieces. While both films are widely viewed as among the finest ever made, Coppola and cast spoke again and again about the films' humble origins, when Coppola was a young, untested director, Pacino was an unknown theater actor who the studio, Paramount, was loathe to cast, and few thought the source material — Mario Puzo's best-seller — was the stuff of great cinema. "I was disappointed in the book when I first read it because it's very long," said Coppola, who called Puzo's book "a bit of a potboiler." "Much of the book — about a third — is about Lucy Mancini's anatomy," he said. Coppola's battles over casting Pacino as Michael Corleone have long been Hollywood legend. To help convince the wary studio, Pacino said he did more screen tests — including after he actually got the part — than he could remember. Pacino even suggested Coppola shouldn't fight so hard for him, telling him, "It's OK. We'll work again. There are other things to do." But Coppola was enamored with Pacino. After meeting him in San Francisco, he couldn't shake the image of Pacino as Corleone. "I just saw his face," said Coppola. "Everywhere we went, all the girls lit up for Al, for some reason." When the shoot got off to a rocky start, Pacino lost his already shaky faith. "It's over," he remembered thinking. "This is the worst film ever made!" But Pacino said he was straightened out after a pep talk from Coppola, who showed him early footage of his performance and told the struggling Pacino "to get your chops together." There were many such stories shared Saturday. All marveled at the cat, roaming nearby, that was thrust into one scene where it calmly burrowed in Brando's lap. After the lengthy wedding scene, Pacino said, he and Keaton "got so loaded, we were on the floor." During the same scene, Duvall said, "We were all mooning each other and Brando took it very seriously." Brando, of course, wasn't the only one missing Saturday. John Cazale (Fredo) was spoken of frequently, as was cinematographer Gordon Willis. The event was moderated by Taylor Hackford and live streamed on Facebook. The conversation sometimes got bogged down and some on the panel hardly spoke, as many watching grumbled. De Niro said little until nearly an hour in. But if it was an imperfect evening, it only highlighted the almost inhumane perfection of the movies Coppola et al produced. Having recently watched the films for the first time in decades, Keaton could hardly contain her amazement. "Every choice you made was so authentically brilliant," she exclaimed to Coppola. "It's so unusual!" With time running out, Coppola tried to take questions from the audience, asking for the house lights to be raised and urging audience members to holler out. But after a few questions, a voice announced over the speakers that the night was over and "The Godfather" got the hook. Coppola and the group gathered together on stage to embrace each other while the crowd, eager for more, took pictures of the legendary "Godfather" team, draped arm in arm.